The spitball was not his only method for upsetting batters. Sports Illustrated's Joe Posnanski wrote of Perry, "My favorite trick pitch of his was the old Puffball, where he would load up on rosin so that a puff of white smoke would release while he threw his pitches. This was made illegal somewhere along the way (because of Perry, of course), but it's so awesome — it's like the sort of thing one of the villains on the old Batman TV show would do." He had a brief call-up to the Major Leagues in 1962, making his debut on April 14 against the Cincinnati Reds. He appeared in 13 games in 1962, but had a 5.23 ERA and was sent back down to Tacoma for the remainder of the year. With the addition of Perry, Bill James called that 1962 Tacoma squad, which featured numerous future major league players, the best minor league lineup of the 1960s. 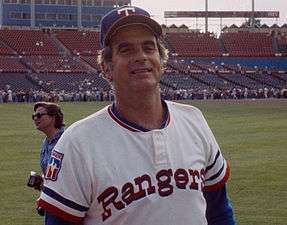 In 1979, Perry posted a 3.05 ERA and a 12–11 record before quitting the team on September 5, saying he would retire unless the club traded him back to Texas. The Padres traded Perry to the Texas Rangers on February 15, 1980. After starting the 1983 season 3–10, Perry was designated for assignment by Seattle on June 26 and the Kansas City Royals picked him on a waiver claim 10 days later. In August, Perry became the third pitcher in history to record 3,500 strikeouts. On July 24 he took the pine tar bat that was used to call George Brett out against the Yankees and tried to hide it from the umpires. In the final months of the season, Perry experimented with a submarine delivery for the first time in his career and took a no-hitter into the eighth inning against the first-place Baltimore Orioles on August 19. Perry retired to his 500-acre (2.0 km2) farm in Martin County, North Carolina where he grew tobacco and peanuts, but had to file for bankruptcy in 1986. He briefly worked for Fiesta Foods as a sales manager, and later in the year Limestone College in Gaffney, South Carolina chose Perry to be the College's first baseball coach. Perry was there until 1991 when he retired. Perry is one of six pitchers to win the Cy Young Award in both the American and National League (Pedro Martínez, Roger Clemens, Randy Johnson, Roy Halladay, and Max Scherzer being the others). He held the record for most consecutive 15-win seasons since 1900 with 13 (1966–1978) and was 2nd all-time to Cy Young, who had 15 (1891–1905). Greg Maddux surpassed both men, with 17 in a row (1988–2004). ↑ Light, Jonathon (2005). "Perry, Gaylord". The Cultural Encyclopedia of Baseball. p. 699. ↑ Perry, Gaylord; Sudyk, Bob (1974). Me and the Spitter. New York: Saturday Review Pess. ISBN 0-841-50299-4. ↑ "Moon Shot". snopes.com. July 20, 2005. Retrieved May 8, 2011. 1 2 James, Bill (2001). The New Bill James Historical Baseball Abstract. Simon & Schuster. ISBN 978-0-7432-2722-3. 1 2 3 Berkow, Ira (March 1, 1982). "Gaylord Perry: The Lonely Quest For Victory No. 300". The New York Times. ↑ Saracena, Joe (June 19, 2003). "Clemens should save pitches for mound, not Hall of Fame". USA Today. 1 2 "SPORTS PEOPLE; More on the Perry Case". The New York Times. August 26, 1982. 1 2 3 MacKay, Joe (2003). The Great Shutout Pitchers: Twenty Profiles of a Vanishing Breed. McFarland & Company. pp. 177–178. ISBN 0-7864-1676-9. ↑ "Gaylord Perry | SABR". Bioproj.sabr.org. Retrieved March 27, 2013. 1 2 Naiman, Joe; Porter, David (2003). "Gaylord Perry". The San Diego Padres Encyclopedia. Sports Publishing LLC. p. 296. ISBN 978-1-58261-058-0. ↑ "Gaylord Perry leaves Padres". The Globe and Mail. September 6, 1979. ↑ "Yanks Lose To White Sox, 4–1; Perry Obtained From Rangers". The New York Times. August 13, 1980. ↑ Gross, Jane (August 15, 1980). "Yanks Greet Perry, A Venerable Newcomer". The New York Times. 1 2 "Gaylord Perry statistics". Baseball Reference. Retrieved April 20, 2008. ↑ "Agreement With Perry, 42, Is Confirmed by Braves". Associated Press. January 8, 1981. ↑ "SPORTS PEOPLE; Quest for No.300". The New York Times. April 30, 1982. pp. 31A. ↑ "Baseball Roundup". The Globe and Mail. July 6, 1983. ↑ "Perry Ends His Career After 21 Years, 314 Wins". The Washington Post. September 23, 1983. ↑ Boswell, Thomas (October 1, 1983). "Three Great Careers Ending, and an Era". The Washington Post. ↑ Trott, William C. (August 18, 1986). "FROM BASEBALL TO BANKRUPTCY". United Press International. ↑ ""You can't eat and farm too" – Gaylord Perry". United Press International. August 13, 1986. ↑ "Padres Acquire Randa From the Reds". The Washington Post. July 24, 2005. ↑ Crumpacker, John (March 10, 2009). "Bay Area Sports Hall of Fame Inductions". San Francisco Chronicle. ↑ Boswell, Thomas (August 27, 1985). "To Combat the New Era of Statistics Inflation, Baseball Needs a New Barometer". The Washington Post. ↑ "TSN Presents – Baseball's 100 Greatest Players". sportingnews.com. Archived from the original on February 27, 2009. Retrieved February 15, 2007. ↑ "Wife of Gaylord Perry killed in wreck". Associated Press. September 11, 1987. 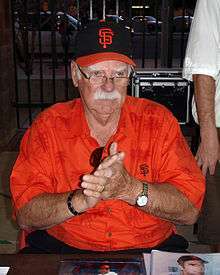 Wikimedia Commons has media related to Gaylord Perry.